Grayson Danford never expected a night with the irresistible Mrs. Wilde, but she was a welcome distraction from the unpleasant duty of breaking up his brother’s impending nuptials. He’s shocked when he discovers his passionate lover is none other than the sister of his brother's intended. 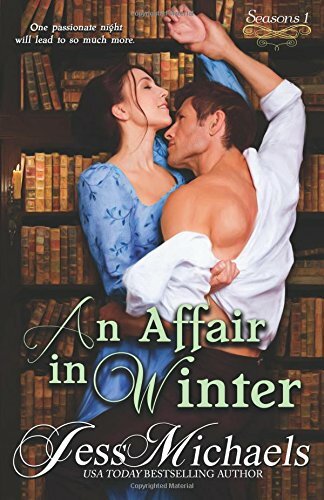 Jess Michaels kicks off her new historical romance series with a sensual, appealing tale of stranded strangers who indulge in a night of nameless passion only to find themselves on opposite sides of an upcoming wedding the next day. I have to say, I really enjoyed this story. Gray and Rosalinde have an immediate physical connection that refuses to stay in the shadows even though their minds tell them they shouldn't do anything about it once they discover the obstacle of Rosalinde's sister's betrothal to Gray's brother. They both have their sibling's best interests at heart and valid reasons for their feelings about the upcoming wedding. A widow, Rosalinde still believes in love and marriage, even though her own was not ideal and wants only happiness for her sister. She also has very good reasons for wanting to remove her sister from their grandfather's controlling thumb. Gray, on the other hand, has watched both of his siblings suffer through the heartbreak of bad relationships and wants to protect them from repeating their mistakes. He views Rosalinde's sister as a scheming, social climber and tries his best to remove his brother from her clutches. Watching Gray and Rosalinde push their agendas while (unsuccessfully) battling their mutual attraction at the same time is a delight. Both characters are well developed and likable - their banter, a delight and their mutual attraction, emotional and steamy. I found myself cheering for them, both individually and as a couple and wondering how Michaels was going to bring everything (for them and their siblings) to a satisfactory conclusion. Never fear. She does just that and in a very satisfying manner, giving one couple a happy-ever-after and setting the stage for the next book in the series. I'm already fully invested in all of these characters and looking forward to each of their books. Next up is the September 6th release of book two, A Spring Deception. Count me in! This sounds just like my kind of book. Ive added this book to my wish list. Hope you enjoy it, Diane! I totally agree - sounds good. I've been trying to read her works for a while and this review just made me want to read it even more. Thanks! I hadn't read her in a while, MsAwesome but this new book reminded me of what I enjoy about her writing. Just added this to my wish list. Sounds like this will be a very good series. Glad you're enjoying it too! This does sound like a book I would love. Hope you'll like it, Annette! I haven't read a lot of historical romance lately, but this one sounds great! I'm adding it now! Thank you for the review. This sounds like it will be an enjoyable read.